“So we meet again,” I said to the brown donkey. Jouma, our Bedouin guide, looked puzzled. Holding two white donkeys was a small boy dressed completely in brown. “No school today for you young man?” Louise asked. With only a halter and reins made of steel, we pulled ourselves onto the saddles. Having had a sneeze attack, I was pleased that the blankets did not smell dusty nor did the donkeys stink. They were well cared for and not too skinny. They looked confused as we waved our good-byes. Once again we came to the boy selling rocks. We passed the boy who, unlike my donkey, sat mute and watched his potential customers walk by. “What is my donkey’s name?” I asked Jouma. Our caravan positions worked out quite naturally. Jouma led Louise’s donkey. I rode solo on my mule. Then Maaz followed leading my friend from LA’s donkey. Donkeys are not guided like horses. As they wander to the left, the driver hits their neck with a switch until it veers right. But along the stairs, switches were not used. The eight hundred stairs to the Monastery began behind the restaurants. As we were going up, we dodged people walking down. Along the trodden path, Bedouin women set up stalls selling trinkets and water. “Careful, careful,” his wife scolded as our donkeys weaved between her small tables and poked their nose under the tent coverings. Jouma ignored her hiss of distaste. His friend, however, grumbled while dodging the donkey pies our steeds laid. “Sorry,” I called out to him. It did not take me too long to quit apologizing for my mule. 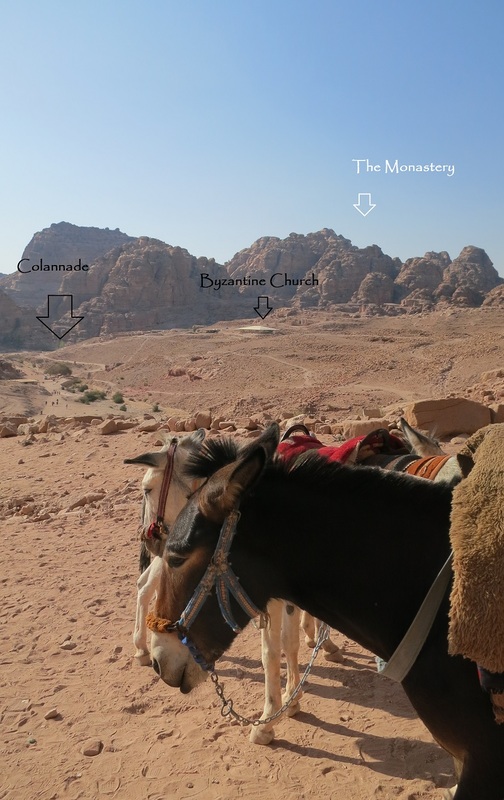 The Monastery trip was my first donkey ride – excuse me – mule ride. I felt like an overloaded burden balanced on tiny ballerina hooves. My mule preferred to either hug the stone cliff, scraping my stirrup along the red rocks, or to tiptoe on the stairs’ edge as I looked down into the canyon floor that fell further and further from sight. From the beginning, Louise proclaimed she was afraid of heights. She was determined not to let her fear ground her and kept her gaze fixed away from the edge. Donkeys are less spooked than horses. But, my half-horse’s nervousness came out when confronted by the extraordinary: music from a disco-ball decorated cave, flapping tent corners or cursing Irish. When Louise’s trip-trapping donkey stumbled on the stones, she exploded. “Jesus, Joseph and Mary! I can’t look. I am too frightened. Don’t leave me, Jouma,” she screamed as she grabbed his shoulder. “Don’t worry. I will take care of you,” assured Jouma whose whispers soothed sixteen children, two wives, an extra boy, horses, donkeys, camels and terrified tourists. Jouma Kublan was a man we instantly felt comfortable with. His mobile is 00 962 7 7753 5425. You can arrange to meet him at the Petra entrance, or, if you are lucky, arrange to meet him at Haroun’s for a sunset trip to the Monastery. He charged us each 50JD for our four-hour tour. His rate matched the rates quoted on Frommer’s. His donkey were well-cared for, and he is a kind, stable individual.